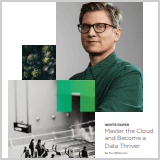 Download the white paper “Master the Cloud and Become a Data Thriver” to learn how to achieve lasting success by becoming an advocate for data-centric technology, modernizing your IT environment, and focusing on the things that matter most. Becoming data-driven requires the ability to serve all stakeholders who work with data. The use of data across roles and industry will only become increasingly restricted, but that doesn’t have to mean a pause or paralyzation in data use.